In addition to narrowing down your number of form fields to only the necessary, you’ll also want to make sure your form fields are labeled clearly with the fewest words possible. You should also mark the optional form fields as “optional” or include an asterisk next to the required form fields to streamline the process. If you accidentally mistype your street address and the form corrects the spelling for you, the form autocorrects your response. If you begin typing your shipping address and a box pops up with the rest of your address asking you if you want to “autofill” the rest of the form fields with your saved address, then your form is autocompleting your response for you. By implementing autocorrect and autofill features on your mobile forms, you’ll improve user experience through a quick, efficient, and straightforward process. When you’re completing a long or multi-step form, list all of your content in a single-column layout. Placing all of your form fields in a single-column format allows your visitors to focus on only one item at a time, making your form easier to read. If you look at a form, especially in a tight space as you would on a mobile device, and see a large amount of content smushed together, you may feel overwhelmed. That’s why separating your content by rows and placing your form fields in a single-column format make your content look and feel less daunting. When you place your multi-step form in a single column, leads are able to complete it more quickly than they would a multi-column form. That’s because the format makes the form easier to read and work through step-by-step. If your mobile form includes short or long responses, you should enable input constraints. Input constraints place a limit on the number of words or characters a person can type into your form field. Writing long responses on a mobile device isn’t always easy due to the size of the keyboard and screen. And if a visitor is unsure about the amount of detail required for a response, they may over-explain, which could end up being a time-consuming process for you and your visitor. An input constraint will typically say something like, “You’ve exceeded your maximum of ___ characters”. There are other types of input constraints that limit input options, like dates on your forms. For example, if someone was trying to make a reservation for a table at your restaurant and accidentally selected a date in the past, your constraint would prevent them from actually being able to select and confirm that date. By setting input constraints, you’ll save your lead time while completing your form fields, and you’ll also prevent yourself from having to review a long-winded or invalid answer. After taking the time to complete a mobile form, it’s likely that a lead will want to make sure their form is submitted properly to ensure you and your team are able to receive and review their information. By using large, bold, and visible buttons labeled with clear actions on them, such as “Submit”, “Next”, or “Complete”, your lead will feel confident about their form submission. These action buttons help you streamline the form completion and submission processes for your leads to avoid any unnecessary confusion or concern. Have you ever tried entering your credit card details in a form via your smartphone? Typing a bunch of numbers on such a small screen with a small keyboard can be a tedious process. Card scanning apps, such as BlinkID and card.io, have become increasingly popular for that exact reason. When making a purchase, your visitors can click a button that takes them to a screen where they can use their mobile device’s camera to take a secure photo of the front and back of their card, whether that be their license or credit card. With just a couple of pictures, your leads will be finished with one of the most time-consuming parts of your mobile form completion process. These card scanning apps keep your visitors efficient as well as frustration and error-free. While completing a simple email signup or a registration form, have you ever been asked to provide personal information that has nothing to do with the signup form itself? This is a common phenomenon in all types of forms (not just mobile). Asking someone for personal or other sensitive information without explaining your need for it can be a bit sketchy. If you’re asking a question that doesn’t necessarily relate directly to the reason your visitor is filling out the form (whether the field is required or optional), then you should create some type of summary box or notification that they can click on to read a short description of the reason why you’re asking for this information. This way, your form will feel professional and thoughtful. No matter what type of mobile forms you have on your website, you should provide your visitors and leads with their current state of progress, success, or completion while they work through them. If you have a long, multi-step form, you should include a progress bar at the top of your form so your visitors are aware of how much longer they’re going to be working through the form. 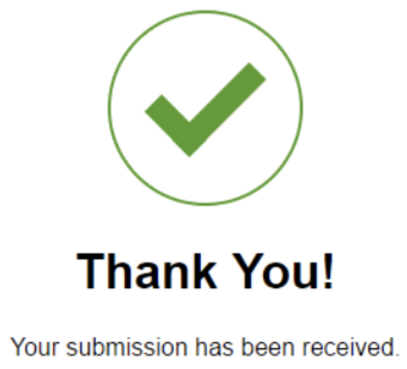 Additionally, once your leads submit their forms, you should direct them to another screen or page that says something like, “Success!” or “Thank you for submitting the form!” so they know their submission worked. While completing your mobile forms, your visitors are bound to make a mistake here or there. Your mobile forms should flag these errors in real-time so your leads can remain efficient and accurate. For example, if someone adds the incorrect zip code alongside their street address, make sure your mobile form flags it with an error message so there’s no time wasted and your business is sure to receive accurate information. In your message, give your lead applicable, easy-to-understand information that clearly shows the exact location of the error as well as how they can fix it. Appearance and first impressions in business always matter. That goes for your mobile forms, too, because nobody wants to complete a dark, difficult to read, cluttered, and unattractive form. You want your mobile form to be highly functional as well as aesthetically pleasing. You can create a professional-looking form by branding it with your logo and colors. Your mobile form’s appearance should contribute to its readability and positive user experience. It’s no secret that, today, your website visitors are completing and submitting your web forms via their mobile devices. That’s because it’s convenient and efficient, as most people carry some type of mobile device with them everywhere, making it crucial for your forms to be mobile-friendly. Otherwise, your forms will be difficult to read, complete, and submit, which may frustrate your leads or cause you to lose their business completely. By considering your mobile form design and implementing these guidelines, you’ll enhance your mobile form user experience, build positive relationships with your leads and customers, and boost your conversions.